When Linda Burner Augustine (’83 Home Economics and Honors) was asked by WSU Executive Chef Jamie Callison in spring 2012 to help create a cookbook, she was intrigued. She was well established in the Seattle area as a chef, caterer, food consultant, entrepreneur, and most recently, a much-followed blogger.Linda has always followed her motto: “Food is life. Good food is good life.” She uses primarily seasonal fresh vegetables and fruits and regional quality meats. Her blog, “A Year at the Table,” offers tantalizing dinner recipes based on short lists of ingredients and easy-to-follow instructions. Jamie teaches in the School of Hospitality Business Management in the WSU College of Business. He leads students through front- and back-of-the-house operations in the commercial kitchen and dining room of the J. Willard and Alice S. Marriott Foundation Hospital Teaching Center in Todd Hall. They produce, for example, the popular Feast of the Arts dinners served during fall football season on campus. Jamie was asked by the Board of Governors, President Elson S. Floyd, and Dean Eric Spangenberg to create a book of favorite food items, the sales of which would benefit students by helping to fund repairs and renovations in the Marriott center. The idea had the support of the WSU Regents and top administrators, as well as alumni and donors. The cookbook challenge was to meet a fall 2013 rollout deadline. For Linda, it was also a chance to do something for WSU, a school that is close to her heart. She lived in Pullman during her elementary school years, when her father, H. Blair Burner (’72 Ph.D. Computer Science), was a doctoral student and instructor in computer science at the university. The family moved to Bellevue; following high school Linda chose WSU for college. She will be at the 2014 CougsFirst! Trade Show April 23 at the Meydenbauer Center in Bellevue, to talk about “The Crimson Spoon,” and sign copies of the book. It was there that she met, and worked for, her future husband, Bradford (’84 Hospitality Business Management). He was the student owner/operator of the Corner Deli, the Cougar Cottage, and Pelican Pete’s and Toucan Sam’s. Today, he is the founder, principal, and managing broker of Madrona Real Estate Services, LLC, in Seattle. When Linda arrived for college at WSU, her brother, Dell (80’ Communications), was in the Honors College and editor of the Daily Evergreen. He hired her as a photographer, and she followed his lead into Honors. “I loved the Honors College, its small class sizes, and the group discussions among classmates and professors,” says Linda. “Dr. (V.H.) Bhatia was in charge then, and he was warm and friendly but had high expectations for all of us to be better, and do better. Though she had planned to study fine arts and photography at WSU, a summer job in a restaurant changed her course. As a home economics major, she used a test kitchen and studied food science, nutrition and food as it related to business. Following graduation, she worked for a short time in a Seattle ad agency’s food public relations department, but left to pursue more schooling related to food. That led her to Ecole de Cuisine La Varenne in Paris. She received a scholarship created by famous chef and television personality Julia Child. The two corresponded for years and Linda treasures the letters from her mentor. It was La Varenne that she says “put the finishing touches on my education,” learning classic French cooking. 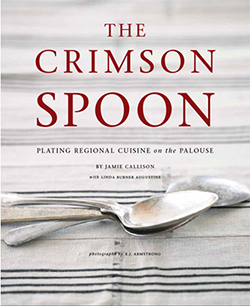 Working with Jamie on the cookbook, “The Crimson Spoon: Plating Regional Cuisine on the Palouse,” was a great experience, she says. She wrote text, edited his, made sure recipes would make sense to average cooks, and tested them time and again in her home kitchen. Linda especially enjoyed the intense weeks in spring of 2013 when Jamie and she worked with the professional photographer to prepare the recipes and photograph them for the cookbook. She became even more expert at food styling, artistically arranging items on a plate to look their best and preparing several versions of the same recipe to have them waiting in the wings as a stand in if needed. By October, the cookbook was ready to sell. It is distributed to vendors by WSU Press, sold online through retailers that include Amazon, and is featured at many WSU venues. With many thousands of copies already in the hands of alumni and other cooks from coast to coast, Jamie would like to see the book on the New York Times best-seller list by the 2014 holiday season. Linda says, “The cookbook project was a wonderful experience for me. I learned invaluable lessons that will help me write my own cookbook someday. Right now I’m going to concentrate on my blog and food consulting work to encourage people to enjoy fresh, seasonal food dinner prepared simply.